Angry Bird is a successful computer game because of its comical and addictive nature. The game was developed by Rovio mobile. It is not only popular to the younger audience but also with older ones. I know of a friend, a forty-something successful man, who plays this game every night after office. He says, this game relaxes him. 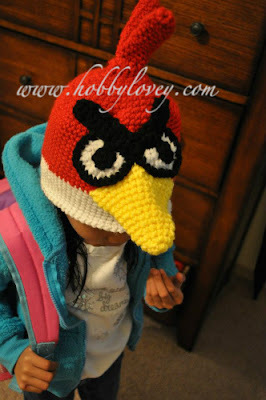 When my friend, Jes, started her online store Hobby Lovey, I can't help but be amazed at her skill in making this Red Bird. What's the best coffee shop for birds? LOL joy! ;)) ahhahahahahah Thanks!! !